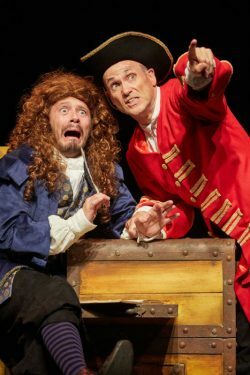 HORRIBLE Histories will rock into the Regent Centre in Christ­church on Thursday 18th April, for two performances at 1.30 and 4.30pm. After a successful West End season, the brand-new Barmy Britain show is making its first tour of the country. 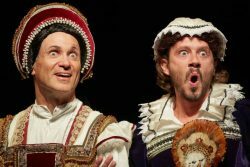 The gag-filled gallop through British history has two actors playing all of the roles! Would you be shaken or stirred by Richard III? Mount a mutiny against King Henry VIII! See Mary Tudor knock the spots off Mary Queen of Scots! Will Queen Elizabeth I endure her terrible teeth? Would you be hanged by King James I for being a witch? Peep into the world of Samuel Pepys and help Georgian detectives find the headless man! You are invited to take a trip into the night with the night soil men and discover how to survive the first ever train ride! These are just some of the fascinating characters that audiences will discover in this splendiferously funny 65 minute show. It’s history with the nasty bits left in! Barmy Britain is written by Terry Deary and Neal Foster from Deary’s bestselling Horrible Histories books. He is the world’s bestselling non-fiction author for children and one of the most popular children’s authors in the country. The show is directed by Neal Foster, designed by Jackie Trous­dale, lit by Jason Taylor, with sound by Nick Sagar, music by Matthew Scott and choreography by Kenn Oldfield. It’s ideal entertainment for anyone aged from five to 105! Posted in Ragazzata, The Play's the Thing on 12 April, 2019 .